Thanks to stylish, modern and innovative style, the domestic hot water heat pump Anemho® + integrates with all kinds of housing. Performance solution, ecologically and economically, it helps to guarantee domestic hot water at desired temperature throughout the year and generate energy savings. 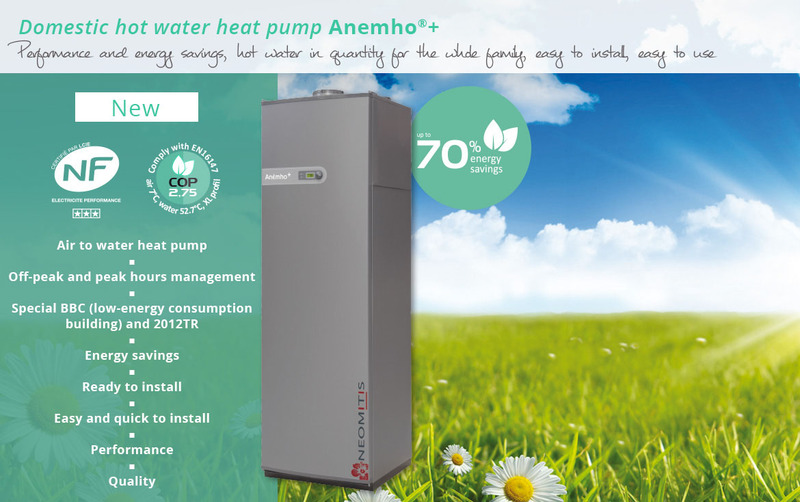 In new housing or renovation home, installation of the domestic hot water heat pump Anemho® +, is quick and easy. +	Comply with BBC (low-energy consumption building) and 2012TR requirements. +	Significant energy savings on your electricity invoice. +	Off-peak and peak hours management. +	Automatic or manual electric booster. +	Dual sound and heat insulation of the PAC. +	High density insulation of the tank without CFC. +	Double automatic safety frost and defrost. +	Plug and play installation.